We call him the “24/7 Dad.” We believe that every child needs one. What we are talking about is an involved, responsible and committed father. We are talking about a dad who knows his role in the family. He understands he is a model for his sons on how to be a good man. Likewise, if he has daughters, he models what they should look for in a husband and father for their children. In our fathering handbooks and training, there are five questions we think every responsible father should answer. As you read, ask yourself these questions. These five questions come with a guarantee: if you answer each one honestly and take action, you will become a 24/7 Dad! 1. Self-Awareness. The 24/7 Dad is aware of himself as a man and aware of how important he is to his family. He knows his moods, feelings and emotions; capabilities, strengths, and challenges. He is responsible for his behavior and knows his growth depends on how well he knows and accepts himself. Don’t run by this first category without some self-reflection. Be honest with yourself as a man and father. Do you know what part of the day you are likely to be most tired and annoyed? Be discerning about how you treat your children during these times. The 24/7 Dad also knows his ability to be with his children is affected by the choices he makes. With your vocabulary, replace “I’m too busy for XYZ” with the words “I didn’t make XYZ my priority.” Hear the difference? So, the 24/7 Dad asks himself: How well do I know myself? 2. Caring for Self. The 24/7 Dad takes care of himself. He gets annual physicals, eats right, exercises, and learns about the world he lives in. He has a strong connection to his family and community, and chooses friends who support his healthy choices. The 24/7 Dad models for his children that he respects and likes himself because he makes good choices. When’s the last time you were at the doctor? If your answer to this question is “I go to the doctor every decade whether I need to or not!” you may want to consider modeling a different standard to your son or daughter. So, the 24/7 Dad asks himself: How well do I care for myself? 3. Fathering Skills. The 24/7 Dad knows his role in the family. He knows he should be involved in the daily life of his children. Consider this: Who dresses and feeds your kids? Who attends parent-teacher conferences? Who supports their sports and other interests/activities? Who helps with homework and tucks them in at night? Of course the daily schedules of work factor into this equation; however, if your answer to all of these questions (and more) on a daily basis is “mom,” we have a problem. The 24/7 Dad uses his knowledge of the unique skills he and his wife/the mother of his children brings to raising his children. In other words, he knows the difference between “fathering” and “mothering.” Said a different way, if you weren’t in the family, would anyone notice based on the daily household tasks? 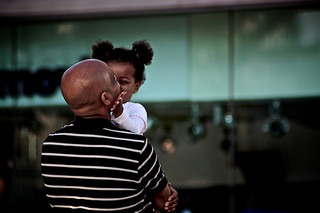 So, the 24/7 Dad asks himself: How well do I “Father”? 4. Parenting Skills. The 24/7 Dad nurtures his children. Yes, nurturing is for men to do as well. He knows how his parenting skills help to develop their physical, emotional, intellectual, social, spiritual, and creative needs. His children trust and feel safe with him because he cares about and nurtures them through the use of proven parenting skills. The 24/7 Dad uses discipline to teach and guide his children, not to threaten or harm them. This is big; don’t miss this point. If and when you discipline, how are you doing it? Are you seen as the executioner of the house who comes down from time to time with his golden rules? Discipline is best done with the idea of instructing a child in the way he or she should go. This isn’t done in anger or simply because you have had a long day and are annoyed in the moment. So, the 24/7 Dad asks himself: How well do I “Parent”? 5. Relationship Skills. The 24/7 Dad builds and maintains healthy relationships with his children, wife/mother of his children, other family members, friends, and community. He knows and values how relationships shape his children and their lives. The 24/7 Dad knows how the relationship with his wife/mother of his children affects his children and creates a good relationship with her for the sake of his children. He always looks to improve the skills he uses to communicate with others. So, the 24/7 Dad asks himself: How well do I relate? Dad, what questions would you add to this list? This post was excerpted and adapted from NFI's 24/7 Dad resource. Read the original post in our For Fathers section.